Have you found the perfect NYC co-op apartment to call home? If so, to ensure you are successful in buying the co-op it’s important that you know how to correctly make an offer on a co-op apartment in NYC. Submitting an offer on a co-op in NYC is a slightly more complicated process than submitting an offer on a traditional condo. As a result, it’s highly recommended that you request a buyer broker commission rebate and work with an experienced buyer’s agent during the purchase process. What should I do before making an offer on a co-op apartment in NYC? A buyer broker commission rebate can save you $15,000 or more on the purchase price of the co-op you are looking to buy in NYC. 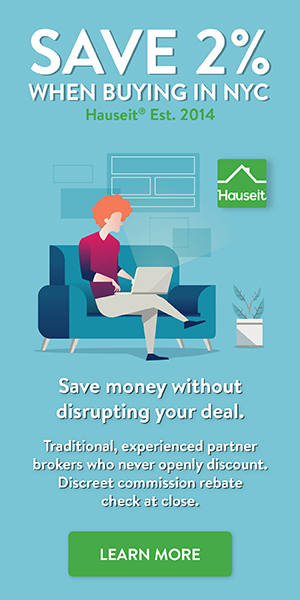 A buyer agent commission rebate is essentially a large, cash closing gift paid to you by your buyer’s agent as an incentive for you having him/her represent you on a co-op purchase. Because all commissions are paid by a seller and the total seller commission bill is not reduced in NYC if a buyer is unrepresented, the services of a buyer’s agent are often considered ‘free’ to buyers. However, by requesting a buyer agent commission rebate you can actually earn money by working with a buyer’s agent. Most traditional buyer agents who do not offer rebates will keep 100% of the commission they earn on your deal and give you a nominal closing gift such as a box of chocolates or an inexpensive bottle of wine. What if, instead of receiving such a small token closing gift, your buyer’s agent shared some of his commission with you in the form of a cash rebate at closing? As a result, it’s important that that you request a buyer broker commission rebate before you make an offer on a co-op apartment in NYC. Will I be able to negotiate the price more if I’m unrepresented buyer? No. Many first-time NYC home buyers often think that it’s advantageous to be unrepresented during the purchase. This is because buyers are often under the impression that if only one agent is involved (listing agent), then the seller will pay less total commission and therefore be more likely to negotiate down the price when dealing with an unrepresented buyer. However, due to the structure of NYC commissions this could not be further from the truth. Because ‘exclusive right to sell’ listing agreements are used by 97% of sellers in NYC, virtually all sellers agree to pay the same average 6% NYC commission regardless of whether or not the purchaser is working with a buyer’s agent. In other words, under an “exclusive right to sell agreement” there are two potential commission splits. In either case, the seller’s total commission bill is the same: 6%. Under the first scenario, the commission is split 3% / 3% between a listing agent and a buyer’s agent. If the buyer is unrepresented (no buyer agent), then the full 6% commission is paid to the listing agent. What are the additional benefits of requesting a buyer broker commission rebate? In addition to being massive, commission rebates are completely legal and non-taxable. They are even encouraged by the New York Attorney General’s office. We highly suggest you prepare all of this documentation before you begin your actual NYC co-op search. This will prevent a scenario where a more prepared bidder outmaneuvers you and takes your co-op before you’ve finished preparing your offer documentation. Of particular importance to making offers on co-op apartments in NYC is the REBNY Financial Statement. Because co-op buildings are actually private corporations which may be foreclosed on by lenders, co-ops are usually very strict in terms of the financial qualifications they impose on potential new residents. When you look at co-op apartments, you need to understand each building’s specific financial requirements before determining whether or not you can actually afford to live there. How much co-op can I afford in NYC? Before you make an offer on a co-op apartment in NYC, you need to determine whether or not your finances can pass the scrutiny of the building and co-op board. This is why having an accurate and complete REBNY financial statement is beneficial to both you as well as the seller and listing agent who will review your offers. There’s no reason for submitting an offer on a co-op when you likely will not pass the financial requirements, as this will simply result in you being rejected by the co-op board. Most co-ops will mandate a minimum 20% down, however it’s common for buildings to require 30% or more. If this is the case, there will not be any flexibility and you need to have enough cash on hand for the down payment as per the building requirement. You may be able to request a gift from a family member, however some buildings do not permit ‘gifting’. You’ll want to have your buyer’s agent double check all of these requirements before making an offer. It’s rather common for co-ops to require an applicant to have 1-3 years of post-closing liquidity after the co-op has been purchased and the down payment and closing costs have been accounted for. Post-closing liquidity is defined as the combined monthly mortgage and maintenance expense. PRO TIP: Many co-ops will take a holistic approach to interpreting your financials. If, for example, your debt to income ratio is close to or slightly above the target but you have 5 years of post-closing liquidity, then you may still be viewed as a viable candidate. It’s in these sorts of situations that having an experienced buyer’s agent can add significant value to your purchase process. You can expect an experienced buyer’s broker to thoroughly vet a building by speaking to the listing agent and asking the right questions, leaving nothing to chance. Most co-op buildings in NYC target a monthly debt to income ratio of 30% and in many cases 25% or below. What this means is that the combined monthly maintenance and mortgage payment can amount to no more than 25-30% of your total monthly income. If you do not finance your co-op purchase, then your debt to income ratio will just be based off of the monthly maintenance figure since there is no mortgage payment. Is the co-op apartment you are looking to buy in estate condition or otherwise in need of major renovations? If so, before submitting an offer you’ll need to be sure that your current finances can withstand the expected cash outlay for apartment improvements while still allowing you to satisfy the building’s post-closing liquidity requirements. You’ll also want to have your buyer broker review the co-op building’s alteration agreement, which is a document that contains all of the rules and procedures concerning renovations in the co-op building. Individual renovations/improvements to units in the co-op building do increase the overall value and allure of the building, so in that sense most co-op buildings (and current shareholders) are very happy to see a new shareholder (owner) step in and invest in the unit. However, co-ops and their shareholders are also sensitive to the fact that any renovation work is a costly and time consuming undertaking. There are real risks of cost over runs and construction delays. As such, the co-op will make sure that the applicants can comfortably afford even the most conservative (expensive) of renovation estimates. Because of the associated noise and inconvenience of major renovations to fellow shareholders, there is always a risk that a board member or two won’t be interested in a neighboring apartment undergoing a renovation. As such, it’s standard practice during NYC co-op board interviews to never bring up or make any mention of anticipated improvements you plan on making to your co-op apartment! How do I submit an offer on a co-op in NYC? Once you have your documentation in order and have identified a property, it’s time for you to consider the economics of your initial offer. As the negotiation and market expert, your buyer’s agent will play a critical role in sizing up the market and listing agent in order to determine the most intelligent initial offer and overall negotiation strategy. How does a buyer’s agent prepare before submitting an offer? In addition, an experienced buyer’s agent will survey and analyze current, in contract and closed deals for comparable properties in the building and area. The comparative market analysis they conduct will help establish a basis for fair value around which an offer strategy can be developed. Once you and your buyer’s agent agree on the initial offer price, % down and any deal contingencies, your buyer’s agent will submit an offer. What does the NYC co-op offer submitted by my buyer’s agent actually look like? Once you’ve finalized your offer documentation and deal economics (offer price, % down, contingencies, etc. ), it is time for your buyer’s agent to submit the co-op offer to the listing agent. The actual offer submission usually occurs via email, with the offer specifics in the body of the message and all of the relevant documentation (REBNY financial statement, pre-approval letter, etc.) being attached to the email. The following NYC co-op offer comes from a ‘financed’ buyer. As a result, the offer itself makes reference to the percentage down, the fact that the offer is contingent on successfully obtaining a mortgage, and includes a copy of the buyer’s pre-approval letter. PRO TIP: What is a ‘mortgage contingency’? If a buyer includes a mortgage contingency in his or her offer, it means that the offer is subject to a bank successfully extending a commitment to and funding a loan in conjunction with the purchase of the property. If the bank ultimately decides not to provide the mortgage, the buyer may walk away from the deal and recover his or her 10% deposit which was provided at the time of contract signing. Mortgage contingent offers in NYC are less attractive to sellers than all-cash and/or non-contingent offers, which are all but assured to go through without risk of cancellation. The consideration will be in the form of $187,500 cash (25% down) and a mortgage of $562,500 (pre-approved). Please find attached our buyers’ pre-approval letter, REBNY financial statement and purchaser bio (below) for your review. My name is Sara Gao. I immigrated to US along with my parents over a decade ago, and I have been a naturalized US citizen since 2010. After arriving in the United States, I studied physical therapy at SUNY Geneseo and graduated in 2012. For the past 5 years, I have been a practicing physical therapist at a local hospital in Manhattan. I consider New York as my home now, and as a result I decided to search for my own apartment to call “home.” Over the past year, I have been saving up additional funds for the down payment and to satisfy the co-op’s post-closing liquidity requirements. I have been looking for a coop studio apartment in Manhattan. Given the location of my job, I have been looking for a one bedroom co-op on the Upper West Side which is close to the park and the Subway. Your seller’s apartment is a great fit, and I would be honored to be fortunate enough to be able to call it home! We ask that you kindly confirm receipt of this offer at your earliest convenience. Thanks! The following NYC co-op offer comes from an all-cash buyer. Please note that even if your co-op offer is all-cash, most if not all buildings still have requirements for monthly debt to income ratios which are usually between 25-30%. What that means is that you still must have monthly income which is roughly 4x the cost of the monthly co-op maintenance bill. PRO TIP: How do I calculate my debt to income ratio if I’m financing the co-op purchase? The easiest way to calculate your debt to income ratio is to first compute your total monthly expenses. You can do this by using an online payment calculator to compute your monthly mortgage bill and adding in the co-ops maintenance figure. If you have other monthly expenses such as a car payment, you must add this to the calculation. To calculate your debt to income ratio, divide this combined expense figure by your total monthly income. I would like to submit an offer to purchase [apartment number] at [co-op building address] on behalf of my buyers, Jason [redacted] and Alexis [redacted]. Their offer price is $550,000 and it will be an all-cash purchase. Jason is a professor at [redacted] University and her income is $145,000. Her husband, Alexis is an accountant at [big 4 accounting firm] his income is $45,000. Their combined income is $335,000. They have cash asset of $870,000 and no debt. With the $550,000 all-cash purchase their debt to income ration will be well below 25% and they will have decades of reserves in the bank after closing. I attached the offer form. Let me know if you have any questions. Thank you for your consideration and please let me know that you receive this email. Hope to hear from you soon. What happens after I make an offer on a co-op apartment in NYC? Thank you Donna! We encourage you to participate in our industry leading Forum if you have any further questions, or if you have insights into the business. We’d love to hear from you and good luck in your career! Are Buyer Broker Commission Rebates Taxable in NYC?